An honest money system is the only alternative. Nature is in austere mood, even terrifying, withal majestically beautiful. To-day it appears as though it may well be altogether abolished in the future as it has to some extent been mitigated in the past by the unceasing, and as it now appears, unlimited ascent of man to knowledge, and through knowledge to physical power and dominion over Nature. On our plane knowledge and ignorance are the immemorial adversaries. Now whatever the origin of this apparently meaningless jumble of ideas may have been, it is really a perfect and very slightly allegorical expression of the actual present views we hold today. It is curious to reflect, for example, upon the remarkable legend of the Philosopher’s Stone, one of the oldest and most universal beliefs, the origin of which, however far back we penetrate into the records of the past, we do not probably trace its real source. There is nothing left now for us but to get ever deeper and deeper into debt to the banking system in order to provide the increasing amounts of money the nation requires for its expansion and growth. With all our mastery over the powers of Nature we have adhered to the view that the struggle for existence is a permanent and necessary condition of life. In the first place, the preparation of the Nobel lecture which I am to give has shown me, even more clearly than I knew before, how many others share with me, often, indeed, have anticipated me, in the discoveries for which you have awarded me the prize. The whole profit of the issuance of money has provided the capital of the great banking business as it exists today. Man cannot influence in this respect the atomic forces of Nature. There is something sublime about its aloofness from and its indifference to its external environment. 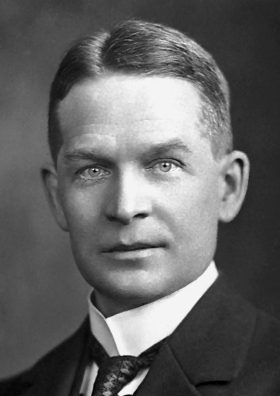 Frederick Soddy FRS (2 September 1877 – 22 September 1956) was an English radiochemist who explained, with Ernest Rutherford, that radioactivity is due to the transmutation of elements, now known to involve nuclear reactions. He also proved the existence of isotopes of certain radioactive elements.